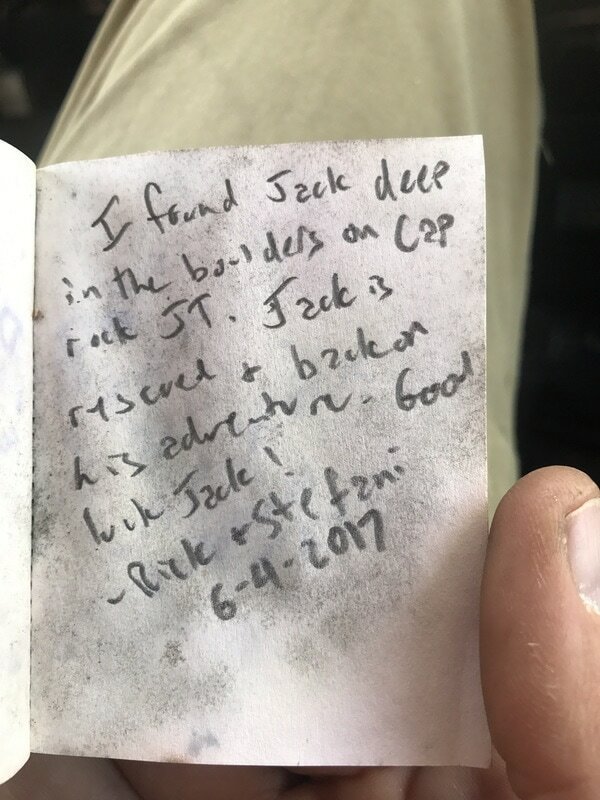 Rick was already in the van when I arrived after mapping the Yablonski Rock and its nearby boulders. It was 97 degrees F outside and all I could think about was the cold sports drink in the cooler. He hadn't even gotten the refreshment out for himself. Instead, he was enthralled with a little tiny book inside of a plastic zip lock bag. "Stef, check this out!" He said with an excited and curious edge. I looked at the words written on the front of the bag "Gram Parsons Logbook." I looked up at him with wide, puzzled eyes. 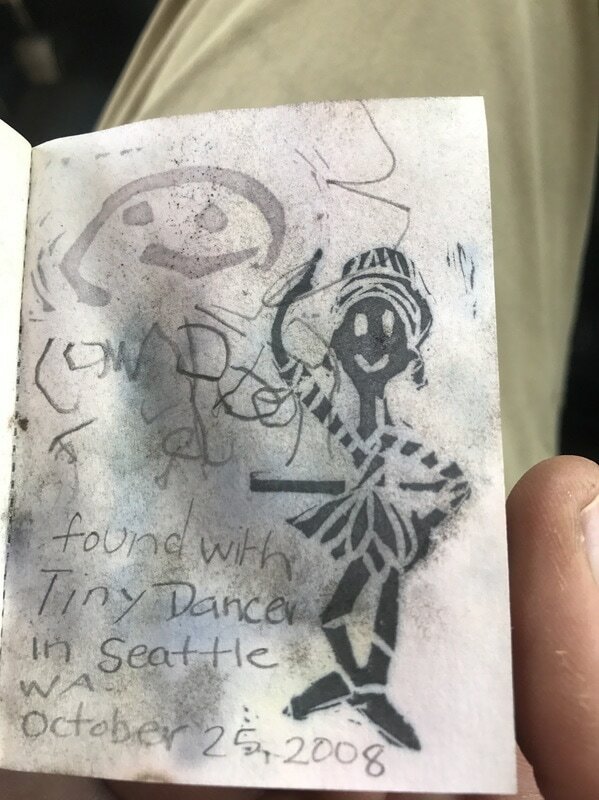 It felt as though we found a treasure. "When I was climbing across a group of boulders," he continued, "I looked down and deep in a crevice, I saw a plastic bag with something square inside. At first I thought it was a baggie with an ID, so I reached down to rescue it." 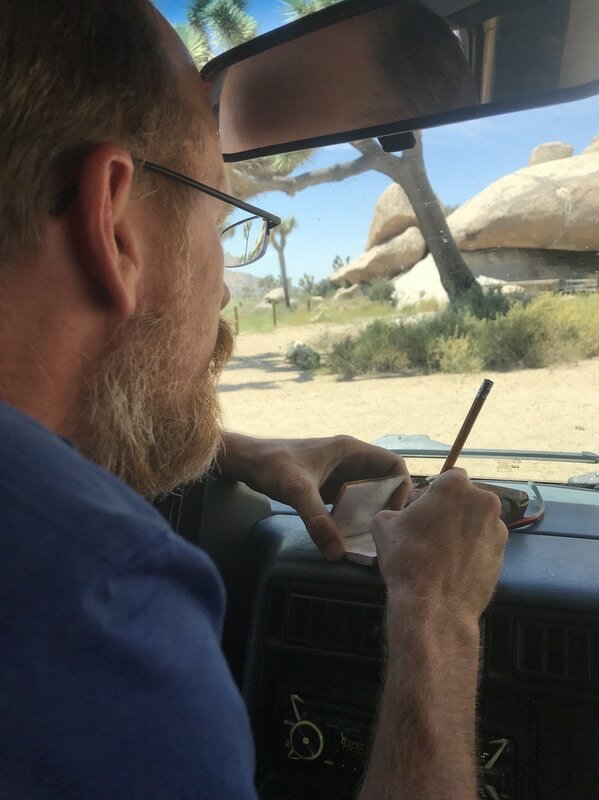 And then, adding to the story, he grabbed the Robert Miramontes Joshua Tree guidebook and read me the following excerpt. "Listen to this," he said. Beaver Boulder...On the boulder's west side is the Graham (sic) Parsons Memorial, a small shrine erected by followers of the musician. The story goes that Graham had an affinity for Joshua Tree, and upon the artist's death, his followers stole his body from the morgue and cremated him at this very location." Rick pulled the old, tiny booklet out of the package. 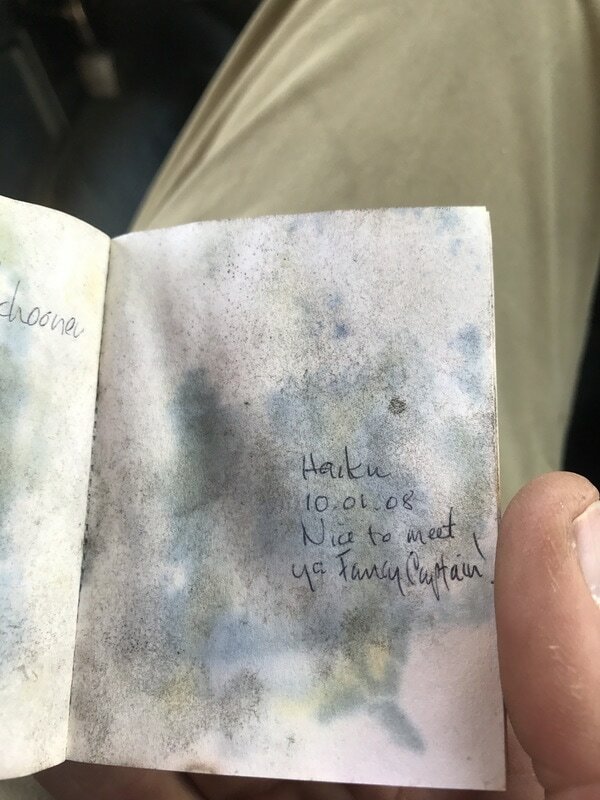 The pages were moldy, stuck together, and worn - exposed to how many years of the elements? He pried each page apart with the care of a curator. There were itty-bitty inscriptions written neatly in pencil accompanied by art. Carved woodblock prints? 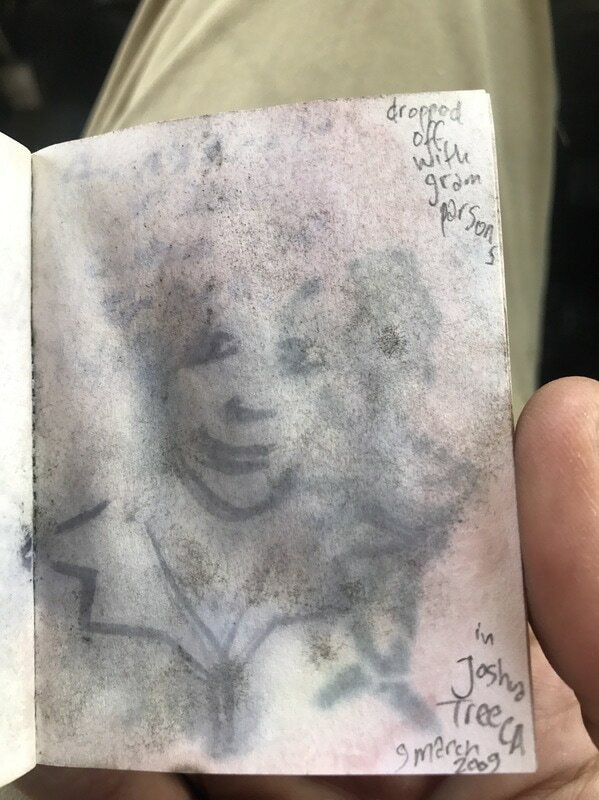 Water color sketches? The art added to the story and the ambience our find. 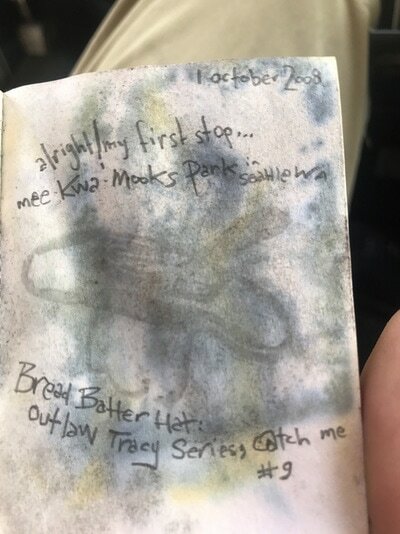 First dated October 1, 2008, the logbook was nearly 10 years old. Although created long after Gram Parsons death (which I later learned was in 1973), its appearance and survival felt historic. 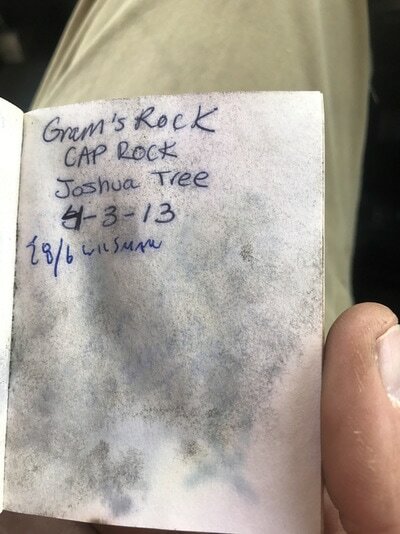 We read through the pages and found the logbook traveled from Seattle, WA to Joshua Tree. 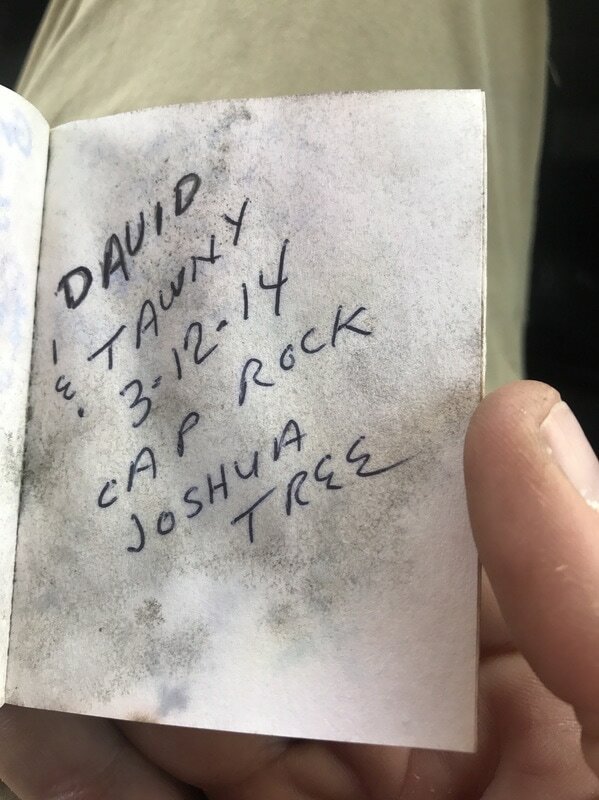 The logbook was delivered to the Memorial on March 9, 2009, by another traveler, and then slipped away into the rocks for years. The next entry was in 2013, and the last entry in 2014. 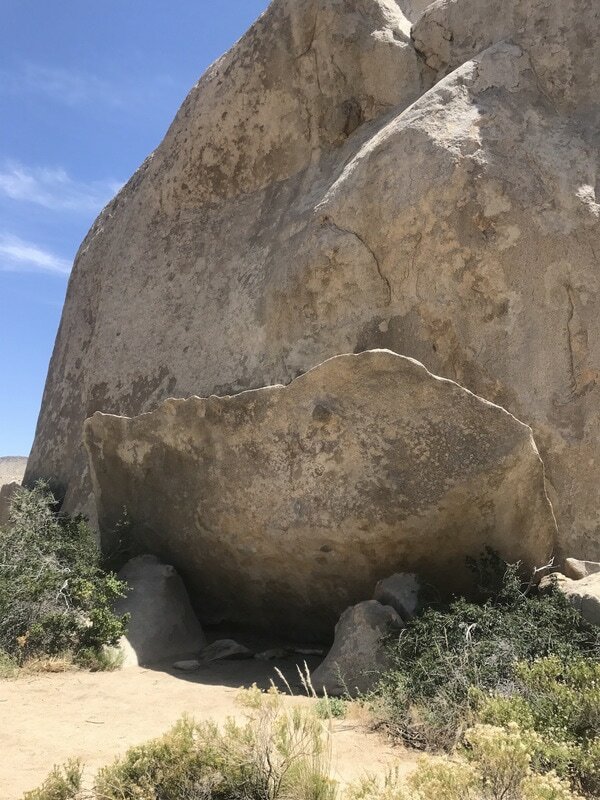 Why it was deep in the boulder field and crevices? We debated what to do with the logbook. 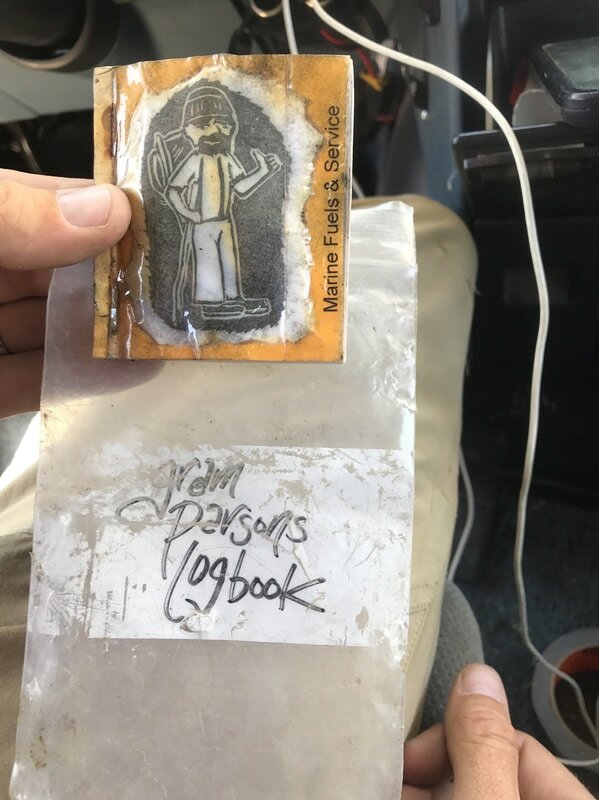 Although it's original manifestation was to travel, or hitchhike with those who found it, someone had carried it here and deemed it the "Gram Parsons logbook." It felt like it belonged in Joshua Tree, at Cap Rock, documenting another history, one that honored Gram and his JTree legacy or one that captured new histories at this location. Love only lasts for a moment. Life holds a brief smile for all. GP. At the end of our mapping day, we returned to Joshua Tree and internet reception. I immediately investigated Gram Parsons' music, his death, his Memorial, and Atlas Quest. Although I had heard of Gram Parsons and his legacy, I was not all that familiar with his music. I combed You Tube and listened to several songs - transported into a different, but timeless era, of 1970s country, hillbilly, gospel, and folk rock. I learned that Gram wrote Wild Horses, the song made legendary by the Rolling Stones (give it a listen below). Gram apparently overdosed from morphine, at the age of 23, in room number 8 at the Joshua Tree Inn. There is an almost unbelievable story of his good friend, Phil Kaufman, stealing the body from the Los Angeles International Airport in order to honor Parsons' wishes to be cremated and scattered in Joshua Tree (rather than buried in Louisiana.) Kaufman attempted a do-it-yourself cremation near Cap Rock, resulting in a huge fireball and partially burned body and casket. According to Wikipedia, 35 pounds of Gram's body was left in the desert, the rest was buried in Louisiana. 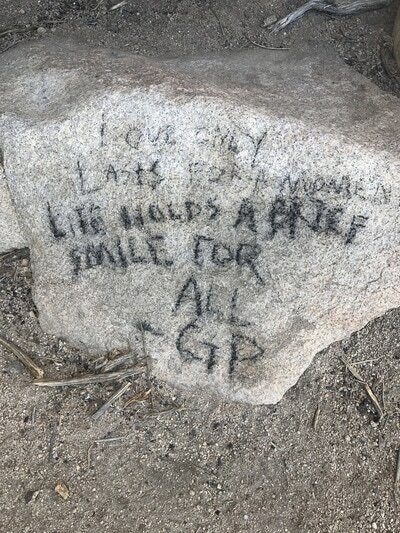 Today, a small memorial at Cap Rock remains, with a few people carrying forward Gram's memory. There is also a 5.9 traverse named in Gram's honor. How many people who complete this climb will go on to investigate the legacy behind its name? 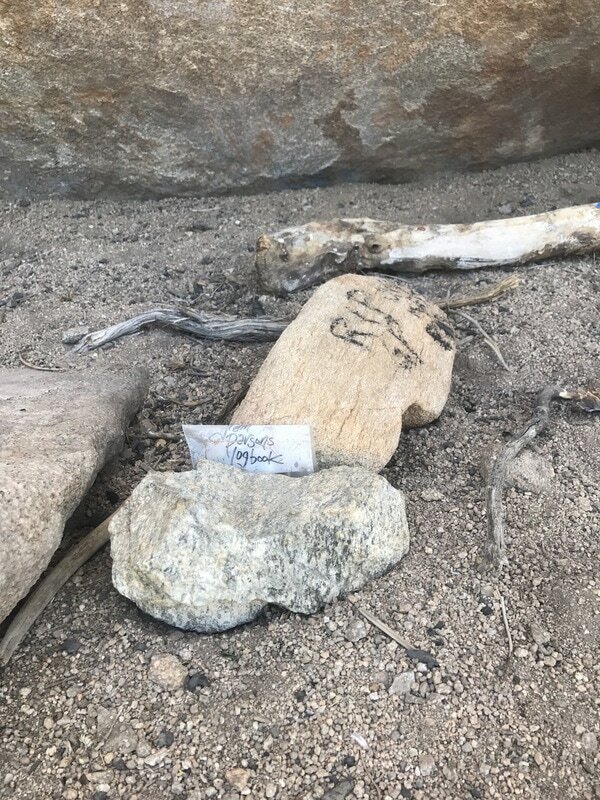 In my research, I also read that the Park Service removes items from the shrine. I now wonder what fate will come of the "Gram Parsons Logbook?" 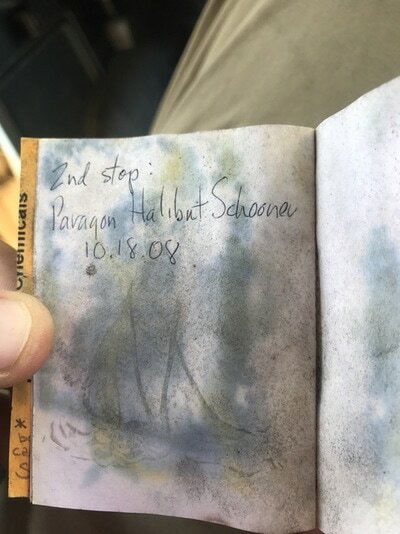 Perhaps, someone will send it on another adventure, or, perhaps it shall remain to log new histories. 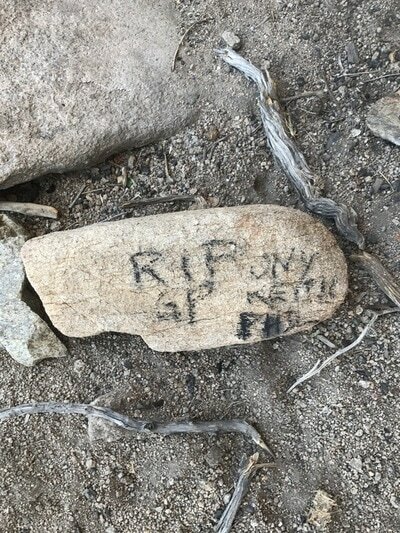 I certainly hope if a Park Ranger removes it from its current spot, he or she will pass it along, rather than toss it in the circular file. 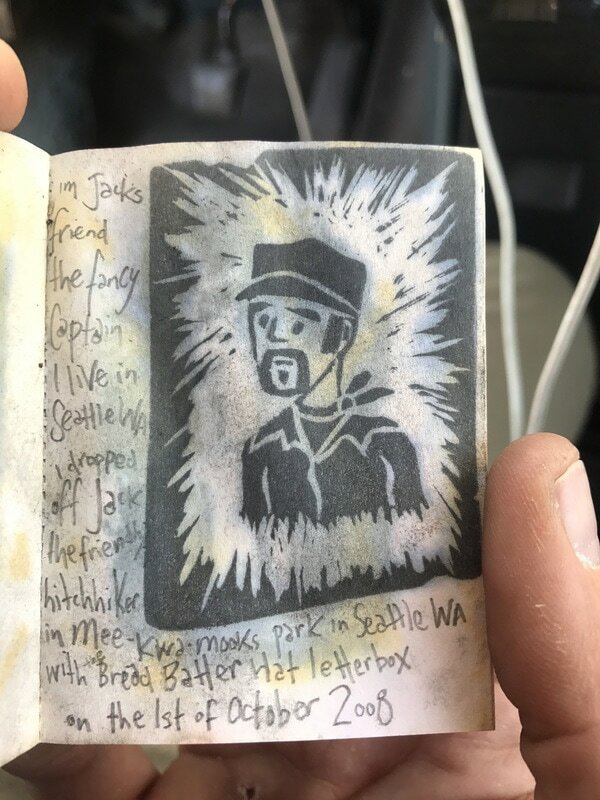 Letterboxing combines artistic ability with "treasure-hunts" in parks, forests, and cities around the world. Participants seek out hidden letterboxes by cracking codes and following clues. 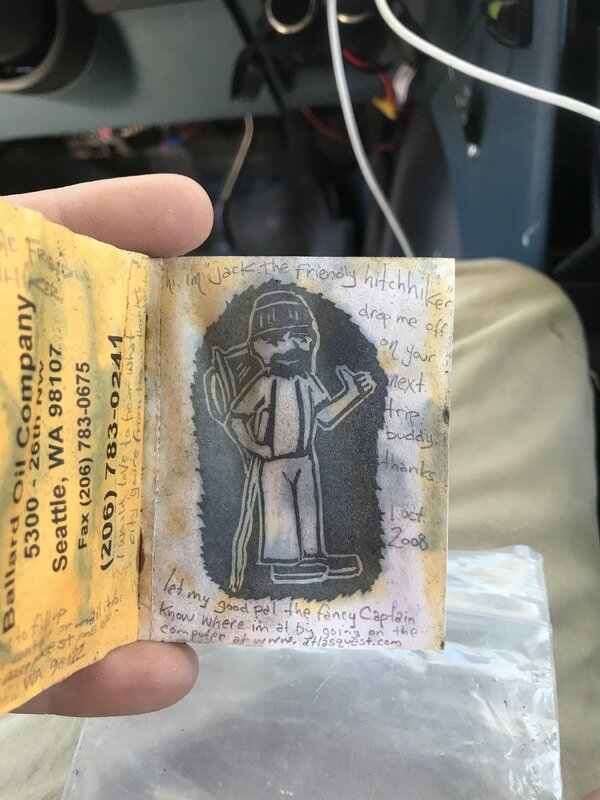 The prize: an image from a miniature piece of art known as a rubber stamp—usually a unique, hand-carved creation. Perhaps because of where and how we found it, we felt it belonged in it's current incarnation as a logbook at the Gram Parsons' Memorial, but these things have a life of their own, and perhaps it will begin its travels anew.